Peter Bogdanow has extensive experience assisting clients with structuring, financing, negotiating and executing complex business transactions, including mergers and acquisitions, joint ventures, minority and control investments, and capital markets transactions. 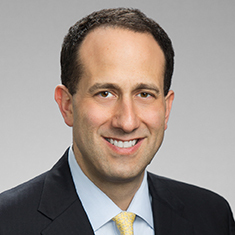 He frequently represents private equity sponsors and related portfolio companies in partnering with other capital sources and buying and selling companies, as well as management teams and operating companies seeking to obtain private equity capital. He also acts as designated acquisition counsel for a variety of clients, from public companies to private equity funds. Peter represents companies in a wide variety of industries, including food and beverage, waste management, health care, energy, software and technology, and manufacturing. Peter is recognized for his substantial experience in mergers and acquisitions, having been consistently profiled as a leading M&A lawyer by The Legal 500. His clients give him high marks, praising his "dynamite" work. Shown below is a selection of Peter’s engagements. Representation of a dairy processor in an equity recapitalization. Representation of a trailer manufacturer in the sale of the company. Representation of a leading prepaid payment network in the acquisition of a leading provider of employee recognition and rewards solutions. Representation of a specialty pharmacy company in its sale to a peer. Representation of one of North America's largest waste management companies in the acquisition of several US companies, having an aggregate value in excess of $500 million. Representation of a leading specialty materials company in the acquisition of a manufacturer of high-performance woven fabrics. Representation of a software company providing SaaS solutions to health clubs in its sale to a peer. Representation of a leader in food and beverage ingredient systems in the sale of the company. Representation of a US drone manufacturer in the sale of the company. Representation of a high-tech automotive inventory management tool/software company in its sale. Representation of a manufacturer of premium branded pet foods and treats in the sale of the company. Representation of a top manufacturer of engineered composite compounds in the sale of the company. Representation of a private investment firm in the acquisition of a provider of cellular PVC building products serving both the new construction and renovation/remodel markets. Representation of a venture capital fund in Series A and B investments in various emerging companies. Representation of a private investment firm in the acquisition of a leading provider of professional AV equipment.